His monument lies in the North Quire Aisle in St George’s Chapel. 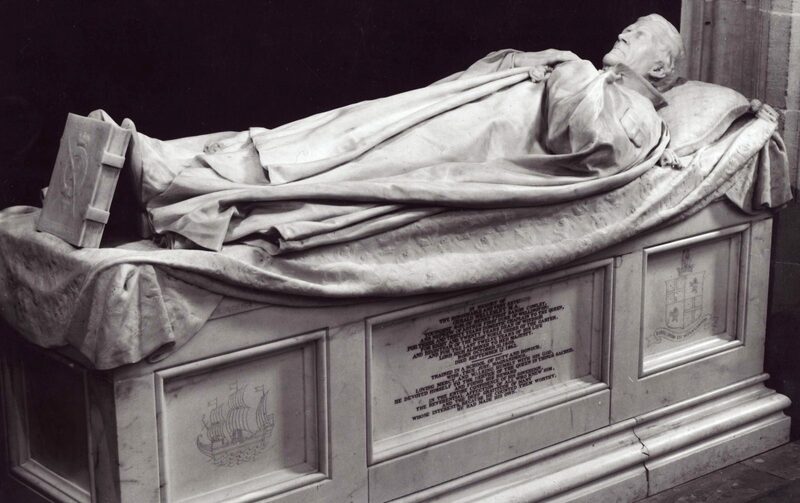 It is made out of white carrara marble on which is the recumbent figure of Gerald Wellesley. The monument was unveiled by Queen Victoria on 1st December 1884. However, for many years there has been confusion as to whether Dean Wellesley is actually buried in the Chapel or not. The Dictionary of National Biography and the St George’s Chapel Historical Monograph, The Deans and Canons of Windsor (1950) state that he is buried here, but there is no entry for this in either the Burial Fees Register [SGC XIX.89] or in the Burials Register [SGC R.2] itself. Contemporary articles in The Times newspaper indicate that his funeral took place at Stratfield Saye, the home of the Dukes of Wellington. Does that mean he was buried there too?